Think that fancy 3D printer of yours is a technological marvel? 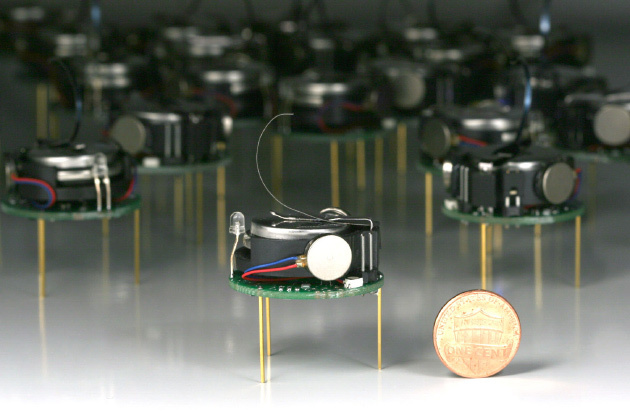 Well, it's got nothing on these tiny coin-sized robots. Computer scientists at Harvard University have built an army of 1,024 bots that collaborate to create various shapes, much in the way ants link to form bridges or birds fly in formation. The Kilobots, as they're called, communicate using infrared light, moving from one precise location to another based on issued commands. To form each object, four robots mark the origin, then each secondary Kilobot very slowly moves into place based on the transmitted image -- the short GIF above represents several hours of work. Of course, that's simplifying the process significantly, so head on over to Harvard's site for all the juicy details.